The Joy of Painting is an American half-hour instructional television show hosted by painter Bob Ross which ran from January 11, 1983, until May 17, 1994. In each episode, Ross taught techniques for landscape oil painting, completing a painting in each session. The program followed the same format as its predecessor, The Magic of Oil Painting, hosted by Ross' mentor Bill Alexander. During its run, it won three Emmy Awards. The show was produced by a non-commercial, public television station. The first season aired in 1983, and initially it was produced by WNVC in Falls Church, Virginia. Later it was produced by WIPB in Muncie, Indiana, from 1984 until the show ended in 1994, and later by Blue Ridge Public Television in Roanoke, Virginia. Most of the series was distributed by what is now American Public Television. 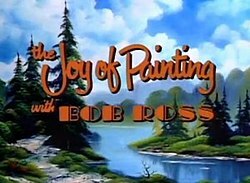 Reruns continued to air in syndication in the United States under the title The Best of The Joy of Painting, featuring a collection of Bob Ross's favorite paintings from past seasons. Each 30-minute show usually begins with Ross (or a guest) standing in front of a blank canvas against a white or black background. Guests included Ross's long-time friend Dana Jester, along with Ross's son Steve, his old instructor John Thamm, and many others. Within the 30-minute program, Ross graphically ran the colors across the screen (this was not done in earlier seasons), as he turned the blank canvas into an imaginary landscape, using the wet-on-wet oil painting technique, in which the painter continues adding paint on top of still-wet paint rather than waiting for each layer of paint to dry. Combining this method with the use of two-inch and other types of brushes, as well as painting knives, allowed him to paint trees, water, clouds, and mountains in a matter of seconds. Each painting would start with simple strokes that appeared to be nothing more than the smudges of color. As he added more and more strokes, the blotches transformed into intricate landscapes. As he painted, he instructed viewers regarding the techniques he was using, he added comments describing the "happy little clouds" and "happy little trees" that he was creating. He would also have home video footage of himself with a baby squirrel, deer, raccoon, as well as another small animal. Each program was shot in real time with two cameras: a medium shot of Ross and his canvas, and a close-up shot of the canvas or palette. At the end of each episode, Ross was known for saying something akin to, "So from all of us here, I'd like to wish you happy painting, and God bless, my friend", and then, the credits roll over a shot of the day's painting, with the show's theme song being heard. Ross created three versions of each painting for each episode of the show. The first, painted prior to taping, sat on an easel, off-camera, and was used by Ross as a template to create the second copy—the one viewers actually watched him paint. After taping the episode, Ross painted a third, more detailed version for inclusion in his instructional books. All three versions were then donated to various PBS stations. The first season of The Joy of Painting aired on many PBS stations across the east coast, but the audience was small, and the quality of the audio and video was so poor that the first season may never air again. [clarification needed] Bob would have to look for a new home on public television, this time, at WIPB in Muncie, Indiana. Now with a national audience, The Joy of Painting was produced by WIPB in Muncie, Indiana. WIPB continued producing The Joy of Painting until the show's ending in 1994. The 31st and final season of The Joy of Painting aired on PBS in 1994, before the death of Bob Ross on July 4, 1995. As part of its launch of Twitch Creative, Twitch.tv streamed every episode of The Joy of Painting over a nine-day period starting on October 29, 2015, what would have been Ross' 73rd birthday. Twitch reported that 5.6 million viewers watched the marathon, and due to its popularity, created a weekly rebroadcast of all 31 seasons of The Joy of Painting to air on Twitch each Monday from November 2015 onward, and will have a marathon of episodes each October 29. A portion of the advertising revenue has been promised to charities, including St. Jude Children's Research Hospital. This event was also repeated on October 29, 2016, for his 74th birthday. In 1993, Ross made TV commercials for MTV. In 2015, all 403 episodes of The Joy of Painting were added to the official Bob Ross YouTube channel. In 1994, Bob Ross appeared on Bill Nye the Science Guy, where he did a self-parody segment entitled "The Artistic Eye with Bob Ross". In June 2016, Netflix repackaged several 1991–1992 episodes of The Joy of Painting under the moniker Beauty Is Everywhere. A second package of episodes titled Chill with Bob Ross was added in December. In November 2017, the first teaser trailer for the 2018 film Deadpool 2 was released, featuring a parody of The Joy of Painting. ^ Dana Jester Painting Bob Ross Style. YouTube. ^ Sally Schenck (director). "Sunlight in Shadows". The Joy of Painting. Season 27. Episode 10. PBS. ^ "Bob Ross - Mountain Range (Season 8 Episode 11)". YouTube. ^ "List of guest painters on 'The Joy of Painting'". TwoInchBrush.com. Retrieved September 28, 2016. ^ Thill, Scott (September 5, 2008). "Annuals + Bob Ross = Such Fun". Wired. Retrieved January 25, 2009. ^ The Real Bob Ross: Meet The Meticulous Artist Behind Those Happy Trees. NPR.org (August 29, 2016), retrieved May 2, 2017. ^ Shrieves, L (July 7, 1990). "Bob Ross uses his brush to spread paint and joy". Orlando Sentinel. Retrieved July 7, 2016. ^ Leopold, Todd (October 29, 2015). "Bob Ross Marathon Underway on Twitch TV". CNN.com. Retrieved October 30, 2015. ^ Machkovech, Sam (October 29, 2015). "Twitch launches 'Creative' category, eight-day Bob Ross Painting marathon". Ars Technica. Retrieved October 30, 2015. ^ "Bob Ross channel on twitch.tv". The Joy of Painting Marathon - Celebrating the official launch of Twitch Creative! #painting #oilpaint #bobross. October 29, 2015. ^ Porter, Matt (November 9, 2015). "5.6 Million People Watched Bob Ross's Twitch Marathon". IGN. Retrieved November 9, 2015. ^ Perez, Sarah. "After Pulling In 5.6M Viewers, Twitch Is Keeping Bob Ross On The Air". TechCrunch. Retrieved November 1, 2016. ^ Cuccinello, Hayley (June 2, 2016). "You Can Relax Now, Because Netflix Is Streaming Bob Ross". The Huffington Post. ^ Dave McNary (November 15, 2017). "'Deadpool 2' Teaser Trailer Offers First Footage and Bob Ross-Style Painting Lesson". Variety. This page was last edited on 21 April 2019, at 08:58 (UTC).